Steven Gerrard says he has almost been jealous watching Manchester United and Chelsea compete in the Champions League during Liverpool's five-year absence. The Reds return to the competition for the first time since 2009 on Tuesday at home to Bulgaria's Ludogorets Razgrad. "There has almost been a jealousy and an envy that we weren't involved," said Gerrard, who won the competition with the Reds in 2005. Ludogorets were founded in 2001 as Ludogorie FC. "I've been craving it. Everyone is looking forward to hearing that music." Chelsea have won the Champions League and Manchester United have finished runners-up since Liverpool last appeared in Europe's elite club competition five years ago. "Watching the likes of Chelsea and Man United in it when we were finishing outside the top four was tough," added Gerrard, who captained his side to second place in the Premier League last season. "I'm just glad it's finally here. It's reward for all the hard work last season. "We need to enjoy it but we're not in it to make the numbers up. We want to do as well as we can." 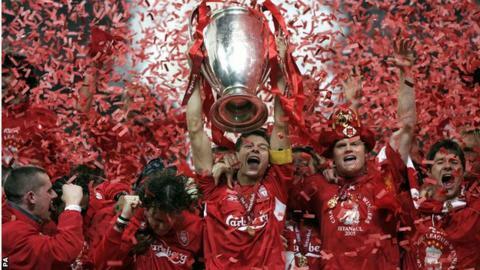 Five-time European champions Liverpool are in the same group as holders Real Madrid and FC Basel. Manager Brendan Rodgers says the Reds will treat Bulgarian champions Ludogorets Razgrad with the same respect as they would 10-time European champions Real Madrid. It will be Rodgers's first Champions League match in charge. "Five years is a long time, probably too long," he said when asked about Liverpool's absence from the competition. "When I came here my main priority was to get the club back to this level. We want to be at the elite level and the Champions League is that."